Tunnels Of Ah is Stephen Ah Burroughs (HEAD OF DAVID). 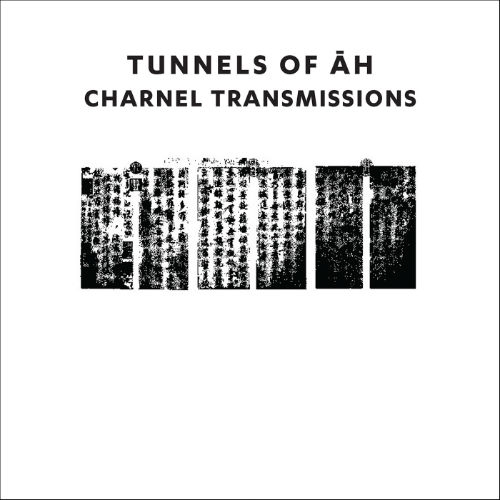 'Charnel Transmissions' is the fourth TUNNELS OF AH release and once more the TOAH sound is taken into ever more oblique regions. Inspired by the 'chime and gong stations' recordings of the Cold War era, 'Charnel Transmissions' sets out to evoke rather than recreate the alienated spirit(s) of those recordings. With the ritual percussion of Francis P. weaving throughout the album alongside cracked electronics, 'Charnel Transmissions' is a disquieting spiral into an ashen world of 'mythostatic psychopomp' where this world is transformed into a charnel ground of gods, ghosts and jackals. Crumbling drones, splintered bursts of noise and buried voices make 'Charnel Transmissions' unconventional and non-linear, much like those charnel dwellers who seek out the lowest to attain the highest. For lovers of ceremonial sounds and dark places.